Defined as the difference between current assets and current liabilities. There are some variations in how working capital is calculated. Variations include the treatment of short-term debt. In addition, current assets may or may not include cash and cash equivalents, depending on the company. The amount of current assets that is in excess of current liabilities. Working capital is frequently used to measure a firm's ability to meet current obligations. A high level of working capital indicates significant liquidity. Also called net current assets, net working capital. See also current ratio, quick ratio. Working capital is the money that allows a corporation to function by providing cash to pay the bills and keep operations humming. One way to evaluate working capital is the extent to which current assets, which can be readily turned into cash, exceed current liabilities, which must be paid within one year. Some working capital is provided by earnings, but corporations can also get infusions of working capital by borrowing money, issuing bonds, and selling stock. An accounting term denoting a firm's short-term CURRENT ASSETS which are turned over fairly quickly in the course of business. They include raw materials, work in progress and finished goods STOCKS, DEBTORS and cash, less short-term CURRENT LIABILITIES. Fig. 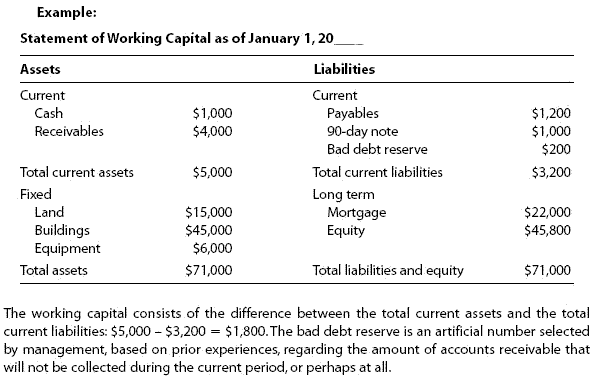 90 shows the major components of the working capital cycle. Increases in the volume of company trading generally lead to increases in stocks and amounts owed by debtors, and so to an increase in working capital required (see OVERTRADING). Reductions in delays between paying for materials, converting them to products, selling them and getting cash in from customers, will tend to reduce the working capital needed. Decisions to hold larger than normal stocks to take advantage of bulk-order discounts or special prices, or in anticipation of materials scarcity, would tie up working capital. Increases in prices of materials or wage rates would also mean that extra working capital would be needed to cover INFLATION. a firm's short-term CURRENT ASSETS, which are turned over fairly quickly in the course of business. They include raw materials, work-in-progress and finished goods STOCKS, DEBTORS and cash, less short-term CURRENT LIABILITIES. Increases in the volume of company trading generally lead to increases in stocks and amounts owed by debtors, and so to an increase in working capital required. 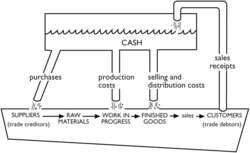 Reductions in delays between paying for materials, converting them to products, selling them and getting cash in from customers will tend to reduce the working capital needed. See also OVERTRADING, CASH FLOW, CREDIT CONTROL, STOCK CONTROL, FACTORING. The difference between cash and other quick assets (current assets) and current liabilities. When we look at the regional performance in more detail, our study shows that while Saudi Arabia working capital deteriorated for 6 consecutive quarters since the third quarter of 2015, Kuwait has relatively the weakest net working capital performance across key economies with circa 30 per cent deterioration from 2014 to 2016," said Bhatt. Mihir said: "We are having numerous discussions with our clients about how they could improve their liquidity through better management of working capital. The working capital management is essential for all corporations (no matter which size) to survive and develop. The parties also need to negotiate the mechanics of the working capital adjustment. 2012) examined the impact of capital expenditure on working capital management of Pakistani cement, sugar, and energy sector industries during the period 2004 to 2010. Importantly, the impact of the working capital reduction on financial performance goes far beyond the one-time release of cash. T&R: Do investors value working capital efficiency? With the uncertainty of the credit markets as a ready source for working capital, many companies are investigating the means to unlock working capital internally by leveraging technology, which is an approach we recommend. Where is your working capital today? Many companies have not had to address this issue in recent years as interest rates have been fairly low and it has been easy to plough cash into working capital. As corporations improve their working capital management, their free cash flow also increases, potentially leading to higher valuations by investors and subsequent increases in shareholder value. With a history of continuous commitment to the region since 1914 and as a leading global provider of integrated cash management, treasury and trade services, Citibank is dedicated to helping our clients re-engineer processes, integrate supply chains and manage working capital more effectively," said Bermudez.